In the telling words of Carl Sandburg, “I’ve written some poetry I don’t understand myself.” Poetry is an outlet for whatever the poet was feeling at that moment—happy, silly, sad, lost or despairing. Poetry is a savior. A good poem can comfort or cure the worst ailment of the soul and revive it, regardless of whether the poem is self-written or read. Children can find the same solace or delight in poetry as adults. The trick is to inspire kids to love poetry by finding the exact words at the exact moment and presenting them in exactly the right way. This is where the librarian comes in. The first step is to learn what types of poetry collections are available and which types appeal to children. Sylvia Vardell’s instructive book Poetry Aloud Here! Sharing Poetry with Children in the Library is a helpful introduction to the many types of poetry, children’s preferences, and how to get kids excited about poetry. Vardell covers the major collections and their differences: general anthologies, topical collections, compilations of works by individual poets, and picture books. Whereas general anthologies are popular among adults choosing poems for children, children are less likely to pick these compilations up themselves. Teachers and librarians teaching to a curriculum or a topic especially admire topical collections, or themed collections; these works are also heavily used by children. Compilations of individual poets’ works, such as Shel Silverstein’s poetry, are popular with everyone. An excellent initiation into the poetry world for children is to pick up a poem picture book or a poetic picture storybook. The illustrations coupled with text lend meaning to the poems and offer kids the chance to form their own interpretations (Vardell, 2006, p. 54-59). Knowing the different types of poetry books and children’s general reactions to each type is the first step to successfully assimilating poetry into the library. A few studies have been done on children’s reactions to poetry. Vardell presents the findings concisely. Children find narrative poems most engaging and free verse and haikus least interesting. Studies find that children prefer “strong sound patterns, rhyme, and rhythm” (Vardell, 2006, p. 75). Humorous poetry, poetry about familiar experiences, and poetry about and starring animals are all very popular with kids (Vardell, 2006, p. 75). This valuable knowledge provides librarians with the necessary “hook” to spark children’s interest in poetry and introduce them to new titles. Children’s literature holds many treasures in the realm of poetry. Librarians have access to many sources that aid in the development of their poetry collections and inform them about new or upcoming books and anthologies. Poetryfoundation.org is one such website. It offers poetry samples through articles, such as “Poetry Goes Back to School,” in which poetry with similar themes are featured. This particular article is a link to lists of annotated bibliographies of poems with themes such as “Ten Poems to Read When You Get Stuffed in Your Locker” by Caitlin Kimball, “Ten Poems to Get You Through Science Class This Year” by Karen Glenn, and “Ten Poems to Send the Person You’re Crushing On” by Becca Klaver. These annotated bibliographies have direct links to each of the poems briefly reviewed and discussed. Themed, online annotated bibliographies with built-in links are most useful when the librarian wishes to recommend poetry to kids going through phases, kids who need a pick-me-up, or kids who need literature to relate to. Similarly, http://www.gigglepoetry.com is a kid-friendly resource for children’s poetry. Kids can read and rate poems by children’s authors or other kids, as well as play fun poetry games and perform poetry plays with their friends using the online scripts. The website also caters to the educator, providing information about how to set up an author’s visit and other differentiated resources to use poetry in the classroom or library. For kids, there is an “Ask the Poet” feature to contact the authors. New poems are posted frequently. The website provides plenty of poems about children’s experiences, ready for exploration and interaction. Concrete poetry is a fun form for children to explore and create their own. The sensory, tactile style of learning is directly engaged through the process of reading these poems. Kids need to twist and turn the book every which way to read the words. The entertaining shapes and sizes of the illustrations, in addition to the fonts, are appealing to children, especially visual learners. John Grandits’ 2004 compilation of his own concrete poems, titled Technically, It’s Not My Fault, is humorous poetry told in clever formats that work brilliantly with the protagonist’s many adventures and mishaps. Readers are sure to enjoy the ridiculous thoughts of Robert and love the simple sketches and shapes that draw attention to and supplement the silly, insightful poems. 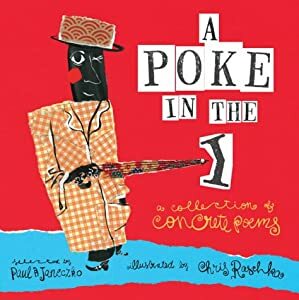 This gender-neutral, non-fiction collection’s strange poetic shapes and realistic yet amusing content is sure to have kids of grades four through eight laughing, although Paul B. Janeczko’s and Chris Raschka’s A Poke in the I is more masterfully compiled. Raschka’s illustrations and Janeczko’s selected poems interact seamlessly on each page of A Poke in the I. This is done to such a degree that the poems would lose meaning without the illustrations and vise versa. The illustrator combines watercolor and oil paints with collage to create simple, yet eloquent illustrations that do not overpower the poetry’s words. The content is about everyday thoughts and experiences like love, food, skipping rope, nature, etc. The language is not difficult and is appropriate for very young children or older children, all of which will surely appreciate the witty illustrations and how they relate to each verse. This poetic picture book was clearly compiled and illustrated to delight the reader; the poems are not heavy with the burden of morals or messages, though they do offer insight into the simple, straightforward perspective of a child. Integrating poetry into a children’s library is easy and enjoyable with concrete poetry. Its flexibility and visual appeal make kids eager (if kids are eager about poetry) to try it. A useful website for creating concrete poetry is http://www.wildaboutwoods.org.uk/elearning/concretepoetry. The Woodland Trust provides this easy-to-use concrete poetry generator. Kids choose a shape to inspire and / or outline their poem or they can draw their own. The website offers sample words and themes for kids to choose in addition to its bright, clear, colorful graphics. Kids write their own poetry and move the words around the page and, when printing, choose to either leave the outline of their chosen shape or remove it. After it is printed, kids color and add their own illustrations to their poems. This generator is a good aid to writing concrete poetry, though kids may also choose to simply draw and write their own. A fun poetry project is for kids to work independently and together to craft a poetry quilt. If the librarian is able, she could make cloth squares for students to copy their poetry onto. She could then sew these squares together, stuff each section, and display the quilt in the library for kids and their parents to admire. Another option for the less crafty librarian would be to connect sheets of paper that students have written their poems on and laminate these together. Each child would create a border around his / her poem to make it look like a quilt square. This project would be especially remarkable if each poem was a concrete poem of the child’s own creation. The various shapes, sizes, fonts, colors, and images would make for an eclectic quilt indeed. Poetry compilations that get kids to be directly involved in the verses are sure to encourage children to love poetry. Hip Hop Speaks to Children: A Celebration of Poetry with a Beat, edited by Nikki Giovanni, is one. This topical collection of rhythmic, powerful poems by famous authors, such as Langston Hughes and Gwendolyn Brooks, includes an audio CD in which most of the authors read their featured poems aloud. Children can follow along and hear how these poems were meant to be read: the pauses, the metrical feet of the poem, the poem’s mood and tone, etc. In the book, each poem has a different design, including font and illustrations, with a designation for locating the tracks on the CD where that poem can be found. The illustrations are vibrant and detailed, each one interacting with the text to enhance its meaning without overshadowing. This juvenile poetry compilation has five different illustrators, which one would assume is disjointed, but the various styles compliment each other and, more importantly, each poem and its relation to its former and following poems. Because this compilation is centered on Hip Hop-like poetry, teachers and librarians with some dance experience can choreograph one or more of these poems with a class of students. Step dance moves would be most appropriate. This way, children will truly feel the beat of the poem and dance around inside it! These performances would be a valuable asset to a class-wide or school-wide poetry reading. Another way to spark kids’ interest is to use a transitional text as a bridge to the new genre of poetry. This transitional text should be something that kids would love and find familiar. One such option is Roald Dahl’s Vile Verses, a collection of Dahl’s lyrical verses found in his other works. Roald Dahl’s publishers scoured his writing for the best, and sometimes obscure or omitted, verses Dahl ever created. They compiled these poems into themed sections and included a Table of Contents and an Index for easy navigation. Almost every child knows Roald Dahl, or at least some of his works; therefore, there is something in this masterful collection for everyone. Each poem tells its own story, classifying this anthology as a collection of narrative poems, which kids are already partial to. According to Quentin Blake’s foreword, the illustrations are from veteran and up-and-coming illustrators across the globe. The illustrations range from full-page spreads in the likeness of typical Roald Dahl characters, to watercolor-and-ink representational art, to charcoal-and-watercolor cartoon art and many other styles. Children and adults alike are sure to be spellbound by this masterpiece poetry collection. A popular, exciting activity to involve the entire school in learning and appreciating poetry is to hold a few poetry readings each semester. Librarians and teachers can team up to prepare students for the poetry reading, encouraging them to write their own poems or choose a poem by their favorite author to read aloud. Kid-written poems read aloud should receive extra praise and even be published in the school newsletter or newspaper! Educators should also participate in the poetry reading to set an example for the children, reading with expression and projection and charisma. A wide array of hats is a fun way to shake up a poetry reading; kids can choose whichever hat they wish and use it as a prop while reading! The theatre department would be an excellent source for borrowing poetry-reading hats. Snapping is the classic way to applause at a poetry reading—teach kids how to snap! Poetry performances by groups are another way to spice up a reading, as suggested earlier with Hip Hop poetry and Step Dance. This level of creativity will help kids feel more comfortable with and more involved in the poetry genre. Librarians can profoundly influence the way children view poetry. A love of poetry should be instilled at a young age so that children have the chance to appreciate its simple, fun forms and topics before progressing to analyzing more advanced forms as teens and college students. Projects and activities for poetry will make learning the genre a memorable and enjoyable experience, both for the librarian and for the children. Librarians who have familiarized themselves with the types of poetry and children’s general preferences will have more ammunition in the poetry fight, for poetry is always the most neglected and rejected literary genre. If the librarian shows passion for poetry, the children will catch the poetry bug too! “Concrete Poetry.” (2011). Woodland Trust. Retrieved at http://www.wild-about-woods.org.uk/elearning/concretepoetry/. Dahl, R. (2005). Vile verses. New York, NY: Penguin Group. Janeczko, P. (2001). A poke in the I. Cambridge, MA: Candlewick Press. “Giggle Poetry.” (2011). Meadowbrook Press. Retrieved at http://www.gigglepoetry.com. Giovanni, N. (Ed.). (2008). Hip hop speaks to children: A celebration of poetry with a beat. Naperville, IL: Sourcebooks, Inc.
Grandits, J. (2004). Technically, it’s not my fault: Concrete poems. New York, NY: Clarion Books. “Poetry Goes Back to School.” (2011). Poetry Foundation. Retrieved at http://www.poetryfoundation.org/article/178601. Sandburg, C. (2011). “Quotes About Poetry.” The Quote Garden. Retrieved at http://www.quotegarden.com/poetry.html. Vardell, S. (2006). Poetry aloud here! Sharing poetry with children in the library. Chicago, IL: American Library Association.